A reclusive author of spiritual books, is pursued for advice by a single mother and a man fresh out of rehab. 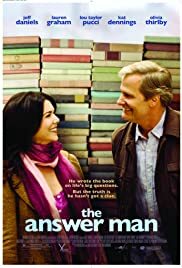 BEFORE: The Answer Man is the film of choice today and continues in the comedy genre of film. Starring Jeff Daniels (last seen in Looper), this film is by no means a blockbuster and after premiering at Sundance in 2009, went to gross less than $30,000 in theaters. AFTER: Unlike last night’s Big Daddy, The Answer Man is an example of a film following a template but not succeeding. This film is another romantic comedy, this time focusing on a love interest rather than family relationships, and follows the pattern of the genre film closely. But this time the humor did not connect and as a result, the film felt dull and uninteresting. One big reason it falls flat is the extremely poor acting. Kris Lucas (Lou Taylor Pucci) is by far the worst of the bunch with everyone else, including Arlen Faber (Jeff Daniels) who while at the top of the pack, is not far behind. The acting in this film is way too forced and unnatural. The actors don’t make me feel for their characters and the things happening to them. Most of the laughter that came from the film, there was some, was from some rare good jokes or jokes that didn’t work but failed so spectacularly that they became funny. For a film that seems to have so many answers, there certainly are so many questions as to what could have been done to make it better. While The Answer Man was not unwatchable (in fact it was easy to watch and follow along, just painfully so at parts), it definitely is not at the top of my films to watch. It seems like it has wasted potential and the subject matter could have created a good film (maybe even a good spinoff book), this execution was poorly done.